Scenes from City Planning's briefing book on the East New York process. On Monday, the Department of City Planning (DCP) commenced the review process for the rezoning of East New York —a major moment for the De Blasio administration’s affordable housing program. East New York is the first of 15 neighborhoods targeted for a rezoning as part of the administration’s effort to build 80,000 and preserve 120,000 units of affordable housing. By rezoning corridors to promote residential and commercial development, the city seeks to encourage the growth of affordable housing while spurring neighborhood revitalization in areas regarded as underdeveloped. All eyes are on East New York to judge the progress of the first neighborhood plan, and questions and concerns—about displacement, overcrowded schools, manufacturing zones and more—are already abounding. 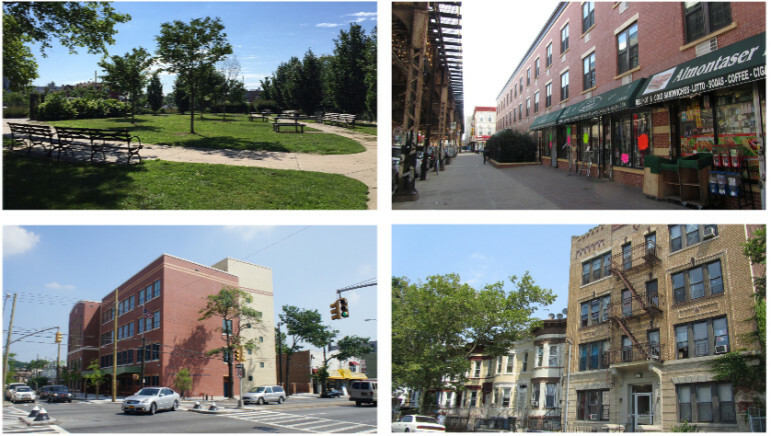 With the launch of the Uniform Land Use Review Procedure (ULURP), the East New York Rezoning Proposal will go to multiple bodies over the next seven months for a vote, including the community boards of East New York and Ocean Hill, Brooklyn Borough President Eric Adams, the City Planning Commission and City Council. At the City Planning Commission review session on Monday, Carl Weisbrod, DCP commissioner and chair of the planning commission, described the proposal as exemplifying “a new approach” to neighborhood planning. The agency stressed the benefits that the plan would offer, including affordable housing, new jobs and new resources and streetscape improvements to enhance the neighborhood’s livability. Later that evening, the Coalition for Community Advancement, an alliance of East New York community organizations and residents, released a press release rejecting the proposal. At the review session, DCP acknowledged the impact that an increased population will have on open space, transportation, construction, and noise (as well as schools and child care facilities, an official later added, though these were initially forgotten from the presentation). The agency says it will continue to explore mitigation measures to address those issues during the course of ULURP. The plan’s Draft Environmental Impact Statement, released Friday, offered a greater level of detail about potential residential development over the next 15 years. The agency predicts that the rezoning will encourage the construction of 3,415 market-rate units and 3,447 affordable units (an estimate that excludes a number of sites that the city deems less likely to develop, due to a large number of rent-stabilized tenants or other obstacles to demolition). The city says it will ensure the construction of affordable housing through its proposed Mandatory Inclusionary Housing program, which also entered ULURP on Monday. Under the program, developers in any designated neighborhood that undergoes an upzoning would be required to dedicate a portion of units to affordable housing. In each case, developers would work with the City Planning Commission and City Council to choose the most appropriate of three options regarding the percentage of affordable units and depth of affordability. The planning commission will eventually weigh in on the plan. Community Boards, the Brooklyn borough president and the City Council will also have a say. Describing affordable housing guarantees as a “key component of the East New York Plan,” the proposal includes a provision stating that even if the city does not approve a citywide Mandatory Inclusionary Housing (MIH) program, such a program would apply in East New York. The plan mandates that developers abide by the first option in the citywide MIH scheme, in which at least 25 percent of units must be affordable to families whose incomes average to $46,620 for a family of three (60 percent of the Area Median Income). These units will be rented at varying levels of affordability, with at least 15 percent of the total for families making below $31,080 (40 percent AMI) and no units for families with incomes exceeding $101,010 (130 percent AMI). As previously announced, the Department of Housing and Preservation and Development (HPD) has also committed to subsidizing additional units—at the least, 1,210 units of housing over the next two years using the Extremely Low & Low-Income Affordability (ELLA) Program. Compared to the Bloomberg administration’s 2005 rezoning of Williamsburg, which dedicated about 11 percent of units to low-income families, the plan makes a bold commitment to affordability, promising that over 50 percent of new units will be available to low-income residents. The plan also includes provisions for deeper levels of affordability than the Williamsburg plan and, through mandatory inclusionary zoning, a better guarantee that developers will deliver the units. But critics say the proposed affordability levels still fall far short of the neighborhood’s need. Nearly 40 percent of households in the rezoning area make less than $25,000. According to the concrete promises made so far, it is possible that as few as 130 units would be available for families making less than $23,310. In other words, critics worry that the “affordable” units under the plan would not be in reach of many East New Yorkers, of whom two thirds suffer from a high rent burden. In their own proposal, the Coalition for Community Advancement called for 5,000 affordable units, including 1,000 units for families making less than $23,310 and an additional 1,000 units for families making less than $11,655. Without deeper affordability levels, the Coalition says, the city’s proposal will fail to address East New York’s rent crisis, while also introducing market-rate housing that could drive up rents in the surrounding area. The Coalition has also called on the city to create a more robust anti-displacement plan, with measures such as increased funds for tenant organizing, tax abatements to encourage small-building owners to keep rents low, and citywide anti-harassment provisions, which would require landlords seeking to make alterations to obtain certifications of “no harassment” from HPD. According to DCP’s analysis, the rezoning will have no “significant adverse impact” on residential displacement. DCP predicts that about 158 residents will be directly displaced by demolitions on development sites, a level that is not considered significant, according to the City Environmental Quality Review Technical Manual. In addition, DCP notes that the introduction of market-rate housing may cause rents in the surrounding areas to increase, creating displacement pressures on over 49,000 “unprotected households,” in the rezoning area and surrounding neighborhoods. The Technical Manual defines “unprotected” as low-income families living in non-regulated or government-assisted housing—excluding families who may be in regulated housing at risk of decontrol. But DCP says that with market trends showing rising rents in East New York, the neighborhood is likely to experience displacement pressures with or without the rezoning. Without the proposal, the zoning area is likely to see an increase of 550 units of market-rate housing, and, due to prohibitive zoning laws, no affordable units. The city says it will further mitigate displacement by working with landlords to maintain rent ceilings, offering them financing and other help, as well as by cracking down on tenant harassment. HPD has also agreed to explore the feasibility of some initiatives proposed this summer by the Coalition for Community Advancement, including the creation of a program to reduce water rates for homeowners and a fund to purchase distressed notes from low-income homeowners, and providing broader down-payment assistance programs for first-time homeowners. With these measures, the city contends, the plan will contribute to the city’s affordability goals—rather than dramatically reduce existing affordable units. The plan rezones East New York’s major boulevards, reducing manufacturing and automotive uses and encouraging residential buildings with commercial ground floors as well as larger commercial buildings such as department stores. But DCP predicts that industrial space will shrink by 27,035 square feet, resulting in the loss of 35 manufacturing jobs. “The proposed Actions would follow rather than induce trends away from industrial and automotive-related uses, which are underway in the study area and the City as a whole,” writes DCP in the Draft Environmental Impact Statement. DCP adds that they are working with the city’s Economic Development Corporation to strengthen use of the neighborhood’s Industrial Business Zone, and that they are also mapping two “Mixed Use” districts in which light manufacturing would be permitted alongside residential and commercial uses. Critics protest the plan, which they believe will fuel displacement in East New York. But critics had hoped for more steps to protect industrial jobs, which pay better than retail work. Mixed Use Districts are ineffective at protecting industrial businesses, the Coalition says: Within the 15 mixed use districts mapped since 1997, there’s been a 71 percent increase in residential and commercial lot square footage and 41 percent loss of industrial lot square footage. Yet DCP says the plan would be an economic boon for East New York, which suffers from a whopping 19 percent unemployment rate. The city says it will help East New Yorkers gain access to this employment by opening a Workforce 1 Center in the neighborhood, a top priority of the Coalition. The Department of Small Business Services is promising other help to neighborhood entrepreneurs. Nevertheless, some East New Yorkers believe more can still be done to improve East New Yorker’s employment opportunities. The Coalition would like to see new developments required to set aside 25 percent of space for local businesses, at discounted rents. 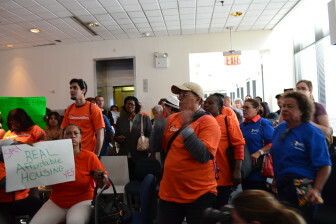 The Walmart Free NYC coalition, with Council member Rafael Espinal’s support, hopes to promote living wages, local hiring, stable scheduling, and other workers’ rights in the rezoning area by using a combination of incentives to developers and Community Benefits Agreements. When DCP announced in July that the city would build a school in East New York with 1,000 seats, some East New Yorkers were not impressed. The new school would barely address existing overcrowding, they alleged, let alone accommodate the children of over 18,000 new residents. The Draft Environmental Impact Statement released last week acknowledges the strain that development would place on neighborhood schools, which are organized into two subdistricts. According to the analysis, without the rezoning and increased population, one would still face a deficit of 650 elementary school seats in 2030. With the rezoning—including the construction of a new school—the subdistrict would face a deficit of 851 elementary school seats. In the other subdistrict, there’d be little overcrowding without the rezoning. But the rezoning would cause the subdistrict to face a deficit of 761 elementary school seats and 404 middle school seats—and no new schools are yet planned for that area. DCP says it will explore a variety of options to mitigate overcrowding in this subdistrict, including reorganizing school space and building a new school. The analysis also notes that development would exacerbate the area’s lack of park and recreation space. While the city recommends that there are 2.5 acres of open space for every 1,000 residents, the rezoning would cause the open space ratio to decline from .614 to .563 aces for every 1,000 residents. To mitigate this problem, the city says it is actively pursuing the creation of a new green space at City Line Park, improvements to Lower Highland Park, and the revitalization of Sperandeo Brothers Park. The analysis also suggests that the increased population could negatively impact traffic and lead to overcrowding on the J/Z line and the Q8 bus. DCP says it will work with the Department of Transportation to improve streetscapes, and recommend the addition of a J/Z train and Q8 bus—a decision that ultimately lies with the New York City Transit Authority. DCP did not agree with Coalition members that the increased population would place a stress on sewage infrastructure, libraries, and police precincts, and did not accept the Coalition’s proposal to designate East New York as a Density Growth Management Area, which would require developers to obtain certification that any development would be met with a sufficient increase in community facilities. 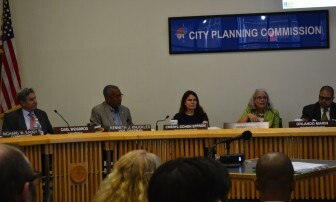 At Monday’s review session, members of the City Planning Commission also brought up their own questions and concerns. Commissioner Michelle de la Uz asked why DCP had not included anti-harassment provisions as part of the plan, while Commissioner Kenneth Knuckles called for greater emphasis on promoting the neighborhood’s Industrial Business Zone, and asked about the potential to build an institution of higher education to drive economic development—a proposal that the Coalition has long asked for. Weisbrod assured them that their thoughts would be taken into account. “This is certainly a work in progress and I’m sure as we absorb your comments, the comments of the community and the comments of the borough president, this will continue to evolve,” said Weisbrod. City Limits’ coverage of housing policy is supported by the Charles H. Revson Foundation. The comptroller says housing is getting increasingly crowded, with immigrants and Bronxites feeling the tightest squeeze.